Razzoo’s Cajun Café has a lunch menu chock full of your favorites, in slightly smaller portion sizes so you don’t have to waddle back to the office. And bonus – they’re cheaper so it’s easier on your wallet too! Leave it up to Razzoo’s to cook the best fried catfish around, smother it in our sweet, tangy meuniere sauce (it’s a browned butter and lemon sauce), then serve it on a bed of white rice. Lunch never tasted so good! It’s exactly what it sounds like: get a soup and a salad! For the soup, choose between either our seafood or chicken and sausage gumbo. For the salad, let us know if you prefer the Chopped Salad or the Caesar Salad. Of course, both come in perfectly sized lunch portions, so you can chow down with no guilt. Even order a craft beer to go with it. Hey, you’re having a salad…you’ve earned it! If you’re a fan of fried shrimp, then you’ll want to give this Texas lunch special a try! Each shrimp is butterflied, battered, and deep fried, but what really makes these delectable shrimp stand out is the sauce. Be prepared to be licking the bowl of our spicy honey pepper Hurricane sauce! Yes, it’s that good! Razzoo’s is known for our crawfish etouffee, but have you ever tried the chicken version? It’s pretty dang tasty too. We use the same rich, dark roux, but instead of seafood, we add chunks of grilled chicken breast. Served over a bed of dirty rice, be prepared to dig in! When looking for the best deal in town for lunch, don’t forget about your friends here at the Razzoo’s Cajun Café! 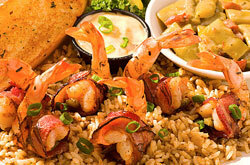 For just $8.99, choose one of your Cajun favorites and then order a beer to round out the meal. Prices and specials are subject to change. Ask your server for details before ordering.